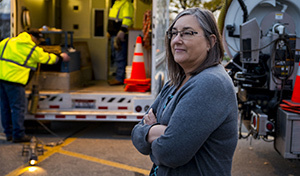 Mary works at West Boise Sewer District. Hired as an office manager in 2012, her responsibilities span bookkeeping, inventory, scheduling, inter-office diplomacy, customer service, reporting to the board, and software maintenance. She is warm, wry, and the epitome of “high-functioning”. Having worked as an accountant (at a bank, light-manufacturing company and nonprofit), as an auditor (for both the IRS and an independent nonprofit), and as a controller for a national nonprofit, her credentials are significant. So when Mary says she labored through the first two years at West Boise Sewer District (WBSD) it should be noted that her own skill wasn’t what was deficient.